Wish to know about Vampire Movies? Good, come learn. Ah, I see my guest has found my vampire movie review section. Well, come, have a seat and enjoy your stay. These creatures have been around for ages, but not in the way that we have come to know and love our undead friends. 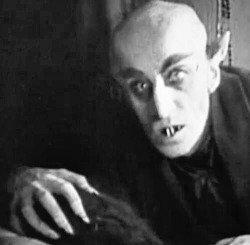 1913 I believe was one of the first cinematic appearance of 'vamps' but it was not until the cult classic "Nosferatu" That they became the blood thirsty creatures of the night we now know and love. Oddly enough, the hideously deformed creature that Nosferatu is, he did not become what so many people have come to think of vampires as. No, that honor belongs to Dracula. He is the undisputed undead master of seduction, with the ability to lure women with a stare, change to bat or wolf by will, and lived for generations off the blood of women. In the many renditions of Dracula (There are over 160 versions of the film!) He is often portrayed to be either related to, or being; the Balkan ruler: Vlad the Impailer. Ah, listen to me prattling on again about things you likely do not care about. I have a Vampire and Zombie history section if you are interested. 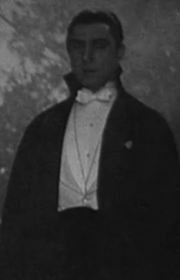 While the classic blood suckers such as Dracula and Nosferatu must be rolling in the stylish coffins they call home by the likes of 'Edward' he is not the first to change the style and meaning of a vampire. Every artist, author, and director has their own version of what the undead seducers should be, and each one brings them to light in various ways. So I open my vaults of knowledge to you dear traveler, so that you can learn from my notes, my reviews, and my own study of them and find out what style of vampire movie suits you best. So please, step deeper into the tombs, friend, and see how so many have become seduced by the night. I do my very best to make sure that the movies reviewed within the tombs are portrayed fairly even if they are not all my cup of tea. You know what they say about movies with vampires in them right? Ah, I know my humor is rusty my guest, I apologize. You know it gets lonely here sometimes and I have nothing better to do than practice trying to make up jokes after all. Find what ones suit you best and enjoy the fruits of my labor of love. These creatures have waited centuries for you to find them, do make sure that you choose well, hrm? Now honored guest, would you like to return to the top of the Vampire Movie Section?